Stop writing out your address, and start stamping! 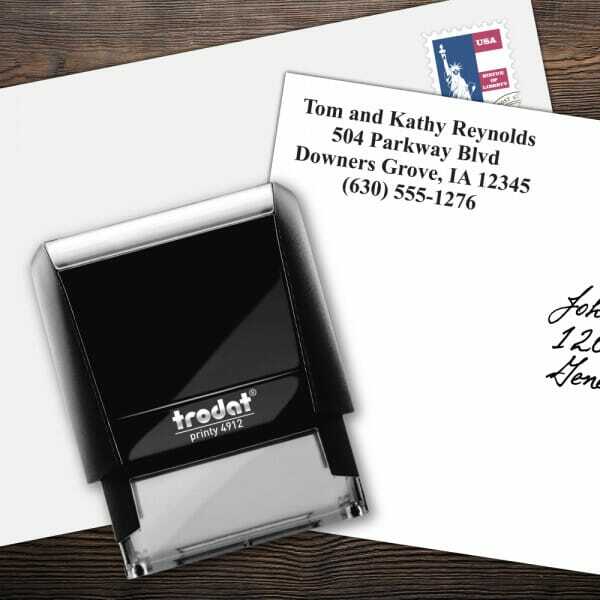 The Trodat Printy Custom 4 Line Name and Address Stamp is the perfect stamp for a standard name and address, plus an extra line for email or phone number. For this stamp we use a Trodat Printy 4912 self-inking stamp which features a compact text plate size of 3/4" x 1-7/8" allowing you to create up to 4 lines of customized text. The Trodat Printy is perfect when you need your impression to be precisely located, such as on an envelope or stationery paper because of its crystal clear positioning window at the base of the stamp. Looking for an environmentally responsible product? The Trodat Printy 4912 contains post-consumer plastic and is a climate neutral product, so you can feel good about helping the environment. When you start running low on ink, changing the ink cartridge on your Name and Address Stamp is simple and clean thank to the special grips that help you avoid touching the pad itself. The replacement ink cartridge 6/4912 is available in black, blue, red, green or violet. Replacement pads are supplied in packs of three, and you can order yours today on Getstamps.com. Customer evaluation "Custom 4 Line Trodat Printy Name and Address Stamp"